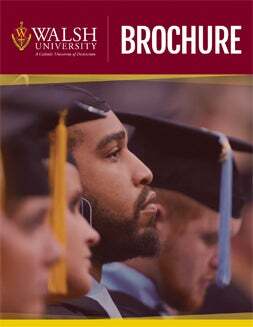 For nearly 3,000 students from 40 states and 35 countries, the search for the right college has led them to Walsh University. Here, on the 136-acre main campus and satellite campuses in Akron, and just outside of Rome, Italy, they have found that learning transcends the classroom, caring faculty help students aim higher, and leadership requires more than intellect. As an independent Catholic university, we encourage individuals to act in accordance with reason guided by the example and teachings of Jesus Christ. Our aim is to develop students' mind, body and spirit – this is Walsh's distinguished tradition and the heart of its appeal.